In a previous post about demolishing piles, I ended at the point of me starting to do items in my “Take Action” box that take two minutes or less. Why that length of time? David Allen says in his book Getting Things Done, “The rationale for the two-minute rule is that that’s more or less the point where it starts taking longer to store and track an item than to deal with it the first time it’s in your hands—in other words, it’s the efficiency cutoff.” Get it? The efficiency cutoff means that it’s going to take longer to shuffle this item around or list it on your to-do list than it takes to do it. If this item deserves to be done at all, it should be done immediately as you process the box. The point is, there are a ton of things that don’t actually take that long to do. Instead of thinking, “I’ll do it later,” do it now. So often I just set things down or put things off because I don’t feel like it. Well, too bad! Who’s the grown-up here? I can force myself to do things anyway. The problem with putting things down is that it means you have started a pile. And piles have a way of growing. Pretty soon, somebody (probably you) sets something else down there. And then it seems okay to park things there. Before you know it, you’ve got a big, messy pile that will take some real time to deal with. This will probably seem too hard (and it will definitely take too long), so you will make excuses not to deal with it. Don’t let it start! Just deal with it right away. 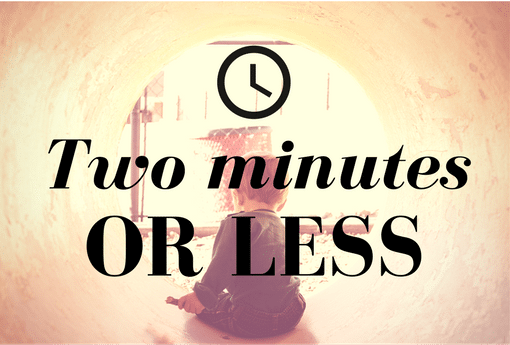 Two minutes or less. You can do it!